A month ago I abandoned Qwerty and regular keyboards and started using Colemak on two (home and work) Kinesis Advantage keyboards. Something I feel I should have done years ago. I have never tried anything other than Qwerty before, so this was going cold turkey from the only layout I have been using for the past 14 years. The last month have been ordinary working weeks and I used Colemak plus Kinesis exclusively the whole time. In the first week I did some training exercises that I put together myself on TypeFaster. I also created a crude Kinesis layout for it. But after the first week I got lazy and didn't bother with it. Currently I can type Colemak fairly well but there is still a lot of typing errors. I might need another month or two before I can type as well as I did before I switched. I don't think that the combination of learning the Kinesis and Colemak has caused any problems. The Kinesis keyboard is quite easy to learn. Unlearning Qwerty is much harder. The special characters are typed with AltGr, which is found on most international keyboards. 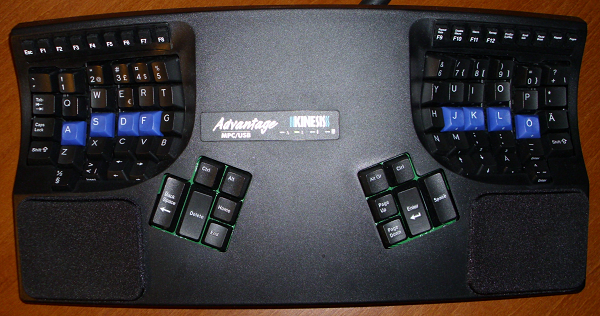 I use a Swedish version of the Kinesis Advantage. The arrow keys are close to all other keys. There is no need to move the hand to get to them. This was something I found very annoying with ordinary keyboards. All modifiers are duplicated on both sides of the keyboard so they can be typed with the opposite hand. For example, to type @ the right hand presses AltGr and the left presses a. The top left button is actually Caps Lock but I have disabled the ordinary Caps Lock usage in Windows. Instead I use it for Push-to-Talk in programs such as Ventrilo or TeamSpeak. The best thing is that all these modifications are done entirely on the Kinesis Advantage keyboard itself with the help of macros and key relocations. There is no need for special software or drivers. As far as Windows knows it's just a standard keyboard. Btw, where did you get that Swedish Kinesis? Their sales dept just told me that I couldn't get a Danish version. I have been using it for over a year now. The layout has worked perfectly for me. I also don't find it that hard to use regular qwerty when I need to. However, there are some small annoyances related to the macros I use to program the punctuation and such characters on the keyboard. Sometimes it's slow to register and some programs fails to recognize them at all. I have considered switching to a software solution but that would probably introduce some new problems. It's something I can live with though. All in all, I have no intention on switching to anything else. I bought mine from Ergoff. On the Kinesis home page it says that it is available in "German, Swedish, UK and US International versions" apart from the default US layout. I did not move any key caps around by the way. The Å and Ä keys really are placed in those awkward positions. This is something I would really need, could you post the macros from your .txt file? Hey Gieron, sorry for the late reply but I do not spend much time here I just check in once in a while. Thank you for the layout I will try this ofcourse, I am now on english colemak and it works fine. My only issue with your layout is the altgr buttons, I use my caps lock as 'esc' for my vimium and vim plugins for chrome/intellij so I need to figure that out before I try it. Thank you very much for the textfiles mate! Hmm, there seem to be a lot more people than I expected who enjoy the combination of Kinesis and Colemak. I guess it just seems like a natural thing to do - the Kinesis is built for comfort and efficiency, so why stick with a layout that isn't? I recently caved and got a Colemak keycap set for mine, with nice subtle legends and still matching the "blue homing keys, black everywhere else" theme. You know how hard it is to find a keycap set that works with Colemak and a Kinesis Advantage? Spill it!